Is a Laptop-Free Zone the Answer to the Laptop Debate? One of the most charged debates within law faculties across the country is the issue of implementing (or not) a ban on laptops in the classroom. Most law schools have wireless Internet access in the building, and some schools even require students to own laptops. More recently, however, individual law school professors (and, in at least one case, the law school itself) have begun banning the use of laptops in the classroom. The impetus for such bans seems to be professors’ concerns with students surfing the Internet during class, checking their email and instant messages, and even instant messaging their classmates “the answers” during class. Some professors feel the laptops create a physical barrier between them and their classes, and they are unable to gauge the students’ understanding of the material. Professor Jana R. McCreary of Florida Coastal School of Law enters the debate with an article that will be published this spring in the Valparaiso University Law Review. Professor McCreary’s article contributes to the debate some empirical research on students’ laptop use. She surveyed almost 450 second-year law students from three law schools (University of Memphis Cecil C. Humphreys School of Law, Nova Southeastern Shepard Broad Law Center, and Seattle University School of Law), asking students to respond anonymously to questions about their laptop use in class and their opinions about laptop bans. Her conclusion: many students use laptops as a tool for note-taking, organizing, and, indeed, thinking; thus, an all-out ban would be detrimental to students’ learning. Her solutions: create a laptop-free zone in the front of the class and/or implement a temporary one- or two-week ban on laptops to allow students to experience class without the laptop and to decide on their own whether to continue to use a laptop. This need to be viewed as capable leads adult learners to strongly resist when they feel as if others’ wills are being imposed. If their educators treat them as children, becoming too paternalistic in the process, the adult learner will resist and end up with an internal struggle between their strong sense of self as an adult and regressing back to feeling like a child learner who is directed and told what to do. While the survey results showed that most students did not claim to be distracted by their own or others’ laptop use, Professor McCreary discovered that most of those students who did not use a laptop for class were distracted by their classmates’ use. Thus, Professor McCreary concludes that banning laptops in the front three rows of her classroom allows non-users the opportunity to avoid the distractions caused by their classmates’ laptop use. Another solution that Professor McCreary proposes is a one- or two-week ban on laptops, so students can determine for themselves whether they are able to take more efficient notes and pay better attention in class. I am dependent on my laptop for taking notes and the act of typing helps me pay attention. I’m not used to handwriting notes, and I’m really slow at it now so I would often miss info. Having the power points helped with the missing info, but getting them handed out provided no incentive to pay attention. So I do[o]dled. Either way, whether there are laptops or not, students aren’t going to pay attention. Don’t punish those who actually pay more attention when they can type. I have not implemented the ban since that spring. I have noticed, though, that the students who don’t use laptops often tend to cluster at the front of the classroom, lending credence to the laptop-free zone solution that Professor McCreary presents. Similarly, my (albeit small) survey results show that most students thought that having no laptops helped them stay focused, and, as the specific comments illustrate, some noticed that they “learned better.” This also suggests that the “laptop vacation” Professor McCreary proposes may inspire some students to ditch their laptops in favor of the pen and paper note-taking method in order to learn better. 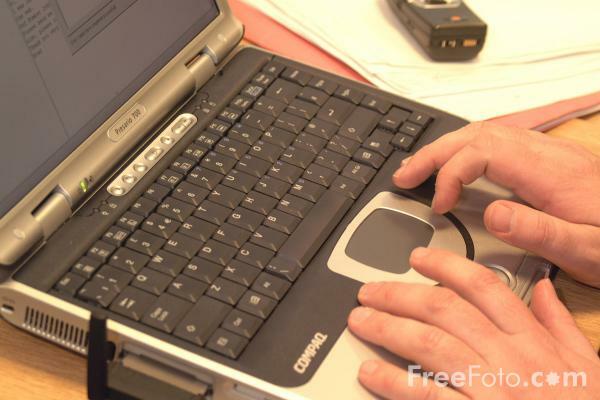 Laptops may be used only for legitimate classroom purposes, such as taking notes, downloading class information from TWEN, or working on an in-class exercise. E-mail, instant messaging, surfing the Internet, reading the news, or playing games are not considered legitimate classroom purposes; such inappropriate laptop use is distracting to those seated around you and is unprofessional. Part of your final grade is based on your professionalism. So, here’s the thing: every time someone brings up laptop use in classrooms, I hear the same refrain about people being distracted by other people’s screens. Well, I’ve never been distracted by someone else’s internet searches or game playing. Do I notice it on occasion? Sure. But I’m not sure being distracted for the half a second it takes to acknowledge that is really going to affect anything. If I’m going to bleed debt for the next 20-30 years in order to go to law school, I’m certainly going to make the most of my lectures. Why shouldn’t I expect others to take care of themselves? Why should it be my fault if someone else wants to look at my screen? Why are they wasting their own time looking in the first place? But, above all, I think the bottom line to the laptop debate is this: Virtually every law student is at least 21 years old when they start law school. Many are older; some are returning students with families and kids. While I completely respect the professor’s perspective regarding a need for students to pay attention to their lectures, one can reasonably argue that it’s their own money that they’re wasting by slacking and surfing. If they feel they can pass their exams without paying attention to the lectures . . . well, they’re big boys and girls, so let them sink or swim on their own. I think we all know that by and large the people who don’t pay attention in class are the ones who are going to suffer come finals, and if they don’t, more power to them. If you suspect that someone is blowing off your class, there’s a simple solution: call on them at random. See if they can answer a question on the material. If they’re completely lost, if they can’t even come within striking distance of the answer (and I’d trust the faculty to know the difference between a student not paying attention and not understanding the material, of course), then knock their grade down. But that’s not failing to be professional; it’s failing to respond to the requests of the professor. In light of the idea that the most harmful aspects of distracting computer usage in class stem from the internet, would not a possible solution be to collaborate with IT and cut off internet access to certain rooms during the day? Well, aside from that perhaps being trickier than one might think, the more important problem with that is that there are VALID reasons for using the Internet. For example, I often pull up statutes or cases we’re discussing in class when a professor decides to cite an obscure footnote and not really clarify or connect it (or, rather, they think they make the connection clear, but it isn’t as clear to students). I’ve Googled IMDB for movie titles to frame it in historical context when a movie’s alluded to in class. So I don’t know that completely eliminating Internet access is worth it. “Is a Laptop-Free Zone the Answer to the Laptop Debate?” If there still is a debate then banning laptops ends the debate in favor of one side only; a “win-lose” solution. That doesn’t seem wise. I see students in my class web-surfing. I don’t find it distracting. Cut off Internet in the classrooms? That might be doable, but we might have to shut down all wireless in the building to accomplish that, which means students studying in the halls or in rooms between classes will also be affected. That seems draconian to me. How about we just decide these are Adult students; tell them to Figure It Out. If someone in front of you is regularly distracting, ask the teacher for another seat. Life is full of distractions; Figure It Out. If a student fails out ’cause they weren’t paying attention; Too Bad. So Sad. This “adult learner” psychobabble is just another way of saying that law students don’t like being told what to do. If so, they have picked the wrong profession. I allow note taking but forbid internet use in my classes. Surfing the Internet during class is the same as reading the newspaper or quietly playing cards or talking on the phone. It is distracting, disrespectful and contrary to the development of critical thought. We spend too much time placating law students. How about expecting them to act responsibly and respect the forum like we expect lawyers to do? This is a no brainer.